John Deere has introduced a complete range of advanced technology fairway, tees & surrounds and rough mowers for 2014, based on extensive feedback from greenkeepers and other golf and turf industry professionals. Common features across the new A Model range include a brand new TechControl display, LoadMatch from the John Deere compact tractor range, internal wet disc brakes and improved operator stations – all engineered to provide users with greater control of the machines, easier operator training and best in class cut quality. All A Models also feature OnCourse Technology, which intelligently integrates electronic controls with the mowers’ mechanical features to deliver improved performance, better diagnostics, more uptime and increased reliability, productivity and operator comfort. The simple to use, password protected TechControl display enables the course manager, head greenkeeper or deputy to quickly set or change mowing, turning and transport speeds, for example, to limit variations in performance by different operators and provide a more consistent, quality finish. On-board visual diagnostics and the ability to set regular service times also help to maximise productive time. A popular feature adopted from the John Deere compact tractor range is LoadMatch, which automatically adjusts the speed of the machine to deliver consistent power to the cutting units during heavy load conditions. This is also designed to maximise productivity and maintain high levels of cut quality. In addition to these key systems on every model, the 7500A, 7700A and 8700A PrecisionCut and the 7500AE hybrid electric fairway mowers feature an improved operator station, with multiple step locations making it easy to get on or off the mowers from either the front or rear. Tyre alignment has also been improved to deliver an even after-cut appearance across the mowing pass. The 8000AE hybrid mower features 18in QA5 (Quick Adjust) cutting units, which narrows the overall cut width to produce tighter striping and superior cut quality, with even fewer hydraulic leak points. The three-wheel design of the 8000AE offers greater manoeuvrability and quicker turns than traditional four-wheel machines, for maximum productivity. In addition, the new A Model E-Cut hybrid electric fairway mowers can be set to automatically deliver reduced engine speed during mowing, with fuel savings of up to 30 per cent. The new John Deere 7200A PrecisionCut, 7400A TerrainCut and 8800A TerrainCut tees & surrounds and rough mowers also share many of the same features as the new fairway mowers. Both the 7200A and 7400A are equipped with a new larger eHydro transmission and redesigned wheel motors for improved traction performance, especially on slopes, while the 8800A is equipped with a new 55hp four-cylinder engine producing over 27 per cent more power. Each machine in the new A Model line-up is produced using an updated assembly process at John Deere’s Turf Care facility in North Carolina, USA. The process incorporates advanced manufacturing technologies such as smart tools and vision systems to provide consistent build quality across the range. John Deere has also announced updates to the 2653B PrecisionCut tees & surrounds mower and the 2500B PrecisionCut and 2500E hybrid electric greens mowers for 2014. To improve operator comfort, particularly during long working hours, the 2653B now features a lower seating position and increased leg room, while a new double-acting steering cylinder enables the operator to achieve straighter cut lines with less effort. 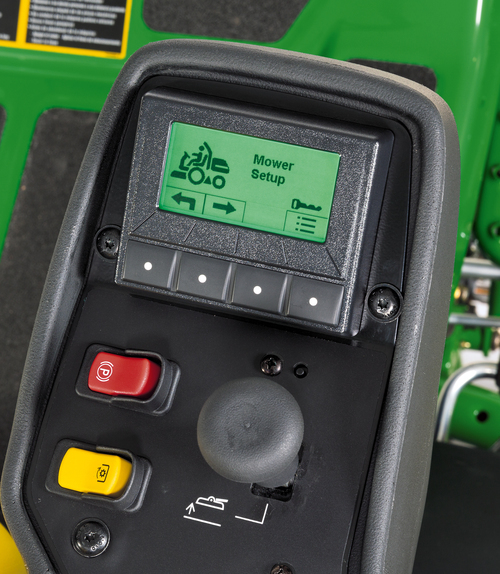 In addition, the 2500B and 2500E models now incorporate electric controllers to provide increased diagnostic capabilities using the Control Area Network or CANbus system, as used since 2009 on John Deere’s E-Cut hybrid electric fairway mowers.